Doss says the tube was the hardest part to figure out. 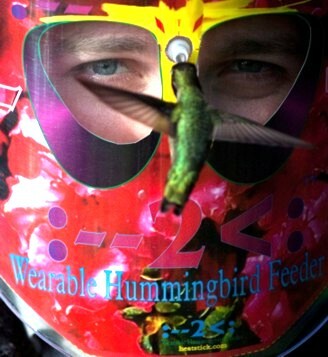 During the northern California spring, when three or four hummingbirds may be buzzing the helmet, he may refill it more than once a day. In winter he can skip a day. The reason people are both fascinated with hummingbirds and frustrated in seeing them is their speed. They may only be there 15 seconds, but if they’re an inch from your eye, you can really drink up the details. “You can actually look into their eyes. You can appreciate their tiny little feet. They have the smallest feet because they never walk. You see markings, so you can see this one’s not that one. You see them feed, then back up and look left and look right.” While the person wearing the hummingbird helmet can distinguish between individual hummingbirds, the birds are oblivious to which person is behind the mask. That means, once the birds in your yard get used to eating from a red helmet, they’ll feel at home when your visiting friend wears it or they see some other guy wearing a helmet 100 miles away. As he nears 700 of the $80 feeders sold–mostly in the US and Canada, although most hummers are in Latin America–there’s getting to be a chance that hummingbirds will start to recognize the feeders, which will make them even more fun to own. I wish to purchase Doyle Doss Wearable Humming bird feeder ASASP for a gift.